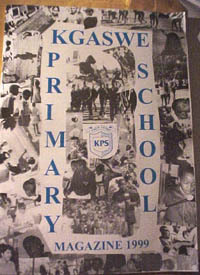 Our friends at Kgaswe Primary School sent us their school magazine for 1999. It is fantastic and we truly enjoy seeing their fine work. 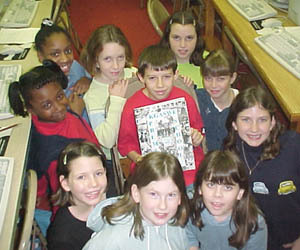 Delmar students are admiring the magazine in the picture below. Our school is called Kgaswe Primary School. It is situated in the town of Palapye, Botswana. We are an International English Medium school with about 210 pupils drawn from all around the world (Botswana, Zimbabwe, Zambia, South Africa, Tanzania, Sudan, Britain, Indonesia, The Phillipines, and many more but not including USA). Most of the children are Second Language English speakers, and the standard of English slowly improving. Palapye is a small town (population around 22 000) built around a coal-driven Power Station, Morupule Power Station. The local mine, Morupule Colliery supplies the coal for the Power Station. Most of the people living in Palapye are employed by either the Power Station or Colliery. There are many other support services such as food stores, clothing stores, furniture stores, pharmacies, etc. in Palapye. It is situated in Central Eastern Botswana, about 270 km (170 miles) north of the capital city Gaborone. Summer temperatures reach as high as 48C (118F), while in winter the temperature seldom drops below 20C (68F). Botswana is a vast country, approximately the size of France. It has a hot, dry climate, and most of the country is covered by the Kalahari Desert. The population of Botswana is extremely small, only about 1.5 million people. Most of the people (over 1 million) live near the eastern border between the capital city Gaborone and the second city Francistown (about 400 km or 250 miles separates these two cities). Botswana has huge diamond reserves, and this, together with a stable government has made Botswana one of the few African success stories. However, like the rest of Africa AIDS is taking a huge toll among the young people here, and many projects are being run to combat this scurge. I will be getting my pupils to write to you and your pupils in the next week or so as I see them. They will tell you about their life, as well as fill you in about our currency (including the 25 thebe coin), flag, etc. Our currency system as you know also includes a "quarter". The currency unit of Botswana is the Pula (the word Pula means rain). P1.00 = 100 thebe. We have the following coins: 5t (thebe) 10t 25t 50t P1 P2 and the following notes: P5 P10 P20 P50 P100. Hi how are you today? Im just fine thanks. I am 12 years old just like you. My name is Kunta Myengwa I know it sounds strange and you cant quite pronounce it. I am in Std 6. My favorite sport is snooker. We found Maryland on the map you also are very far from us. My name is THABANG TLHAPISANG am in standard six my teachers name is MR FOXCROFT he is a nice teacher and he is taking us to ZIMBABWE on the 11th of October 1999 The food I like are chicken and Ice cream and before I forget I am a girl just like you. I hope you will write back to me. HI my name is Kwena. I come from South Africa and I am 12 years old . I am in the STD 6 (grade 6). My favorite games are soccer ,cricket ,softball and swimming. I go to school in Botswana. My favorite subjects are English . Are there any other people that can write to me ? My teachers name is Mr Foxcroft , the first day I went to school I was a bit shy. I like chips and chicken or macaroni with melted cheese !!!. Write back to me tell me more about yourself . My name is Tupo and I live Palapye,Botswana. 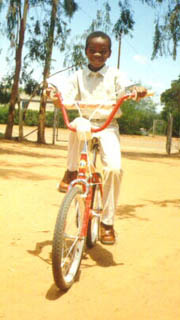 Im eleven years old and I am in standard 6 (the sixth grade).Botswana is a pretty hot country but with lots of fun. How is America, I hear that its very cold sometimes. In this country it never snows. My favorite sport is softball I guess you guys call it baseball. Whats your favorite sport ? Do you love music? My favorite band is the Spice Girls. I guess Ive got to leave. Bye, Bye. I also like sports and my favorite sports are softball and netball which is pretty similar to basketball but bouncing the ball is not allowed and so as running with the ball is not allowed too and normaly girls play it. My favorite team is also the yankes and guess what my favorite baseball player is also Shane Spencer. Theres not quiet a lot of baseball in Botswana but I like watching it on T.V. But there is also one thing I hate about watching baseball is my brothers they always disturb me and they into my nerves if only they could leave me for atleast for a full day I will be saved.